The 2002-2003 season with the planet's favorite animated family is coming to Blu-ray in December! In an early announcement to retailers, 20th Century Fox will be bringing 'The Simpsons: The Complete Fourteenth Season' to Blu-ray on December 6. 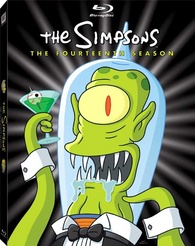 The 3-disc set will present all 22 episodes with 1080p video, a DTS-HD Master Audio soundtrack, and supplements will include: A Haunting Invite From Matt Groening; Audio commentaries on every episode with Executive Producers Al Jean & Mike Scully and assorted writers, actors, and directors; It's Only Rock 'N' Roll featurette; The 300th Episode featurette; In The Beginning featurette; The Halloween Classics featurette; Foolish Earthlings featurette; Deleted scenes with commentary; Multi-angle animation showcase; Original sketches. Blu-ray exclusives include bonus Treehouse of Horror episodes. Suggested list price for the Blu-ray set is $59.99. You can find the latest specs for 'The Simpsons: The Complete Fourteenth Season' linked from our Blu-ray Release Schedule, where it's indexed under December 6.